Ben Davies has proved himself all over again at Fratton Park, according to Paul Cook. 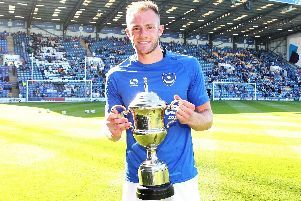 The 34-year-old arrived on trial at Pompey over the summer and filled in at right-back during pre-season, even though he had played in midfield for much of his career. At the time, it seemed Cook was still intent on signing a specialist right-back. But the Blues boss believes the former Derby County and Sheffield United man is the perfect example on how players can turn in consistent displays and cement themselves in his plans. Cook said: ‘At the minute, there are still question marks against some of our players. ‘To get the trust, you have got to earn it. ‘Are they a tick, a cross or a question mark? ‘For example, Ben Davies is now a tick. ‘At the start of the season, he probably would have been a question mark. ‘But I don’t think many would argue that he has been one of the positives for us this season. Davies has probably been Pompey’s most consistent performer this season. But Cook is still keen to reduce his squad number and has made it clear that a few of his players are now on borrowed time if they want to make their case to stay. ‘Ideally, it would be a small number I would like to work with,’ said Cook. ‘It’s hard with injuries because logic tells you that you have to bring bodies in. ‘But the count can’t keep going up and up.